Don’t let the stocky appearance of the new for 2014 Super Soaker Double Drench fool you—it packs a punch that belies its relatively diminutive size. In fact, as a close-quarters water weapon, the Double Drench answers the call like few other water guns we’ve tried. The simple, pump-action design of the Double Drench may be disappointing to those who expect a working trigger from their toy blasters, but the flip-side is a sturdy design with few moving parts. 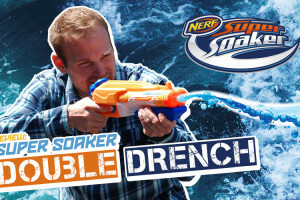 Unlike more complex, battery-powered models, the Double Drench is likely to be one water toy that will withstand many hot summer battles, the occasional drop on a cement patio, and the all-too-frequent “it’s somewhere in the backyard… I’ll get it later” scenario. Without some of the more complex “features” and gadgetry that are common to other water weaponry, the simplicity of the Double Drench is both its strength, and its utility. With minimal quirks and a streamlined design, the Double Drench excels in reliability and practicality. Much like its real-world counterpart, the Double Drench fits the mold of a double-barreled shotgun, trading range and accuracy for excellent coverage in tight quarters. And as with most “sawed-off” models, the short barrel provides for optimal maneuverability and range of motion, especially in a confined space. Clearing the room, deck, patio, or backyard is a relative cinch, given that the Double Drench fires every shot out of 6 nozzles, 3 on each barrel in a triangular pattern. This configuration yields an impressive spread, with some trade-offs in accuracy and ultimate range (versus focusing all of the volume into a single, thicker shot that is less susceptible to wind). 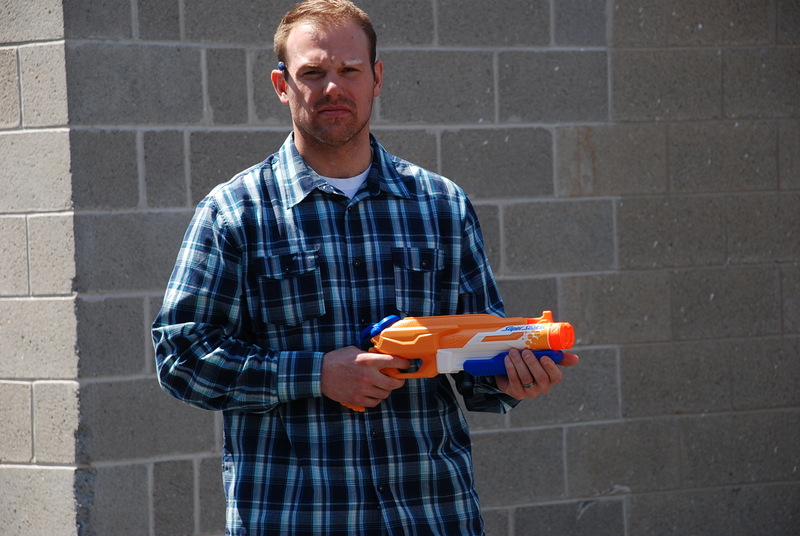 In our testing, we found the Double Drench to be fully capable of soaking an adversary within approximately 30 feet. Stretching much beyond this point begins to see diminishing returns, as the relatively thin streams become too dispersed for effective saturation. Interestingly, we were actually able to hit a max of 60 feet in good conditions, but without any kind of accuracy or soaking ability. Clearly, the double-barrel, 6 stream design allows the Double Drench to thrive in close quarters, but makes it less successful in circumstance where a model that more resembles a rifle (like the Super Soaker Barrage Soaker) could be advantageous. …in water combat, fluid holding capacity can quickly determine who wins, and who is sent running for the hose. 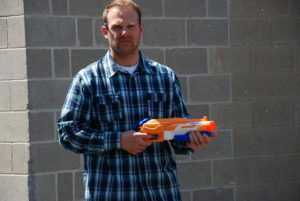 Fortunately, most water warfare does take place in close-quarters, so we’re not terribly concerned about ultimate range. But in water combat, fluid holding capacity can quickly determine who wins, and who is sent running for the hose. And with its whopping 27+ oz. water chamber, the Double Drench delivers in this regard, as well. Relative to its size (17” from barrel to handle, and just shy of 5” in width), this is a considerable advantage—true to its name, the Double Drench also holds double the water! But let’s not get ahead of ourselves. While the Double Drench excels in coverage and capacity, accuracy drops dramatically after about 35 or 40 feet, and its fine streams of water were greatly affected by wind currents. In addition, and as has been noted with other Super Soakers recently, there appears to be a hint of hesitation or lag if one attempts to pump too rapidly (likely due to an overly restrictive internal valve limiting water flow from reservoir to pump shaft). We also found the reservoir cap, located at its rear, to be somewhat fidgety, as it can take a few seconds to remove the cap (which requires a twist before removal). And in the heat of battle, a few seconds could mean the difference between being dry and getting drenched! Users not familiar with the twist-to-remove process could also eventually damage the cap and/or threading. Adding to our concerns regarding the reservoir, the small hole centered on the cap lacks a valve, allowing water to trickle out if the blaster is not held perfectly flat. 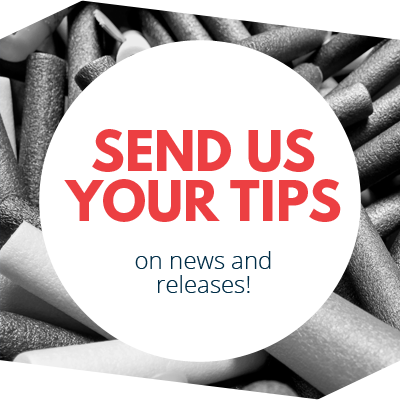 We would also be remiss if we didn’t mention the fact that, as a pump-to-fire design, aiming while shooting is not really possible (but who does that in a water fight, anyway?). Lastly, we wanted to address the issue of aesthetics. 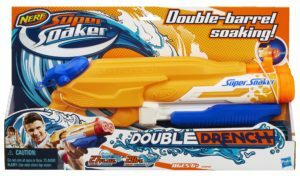 While we like the blunt, sawed-off look of the Double Drench, the current color scheme used by Hasbro for the Super Soaker line leaves something to be desired. With a predominantly salmon-ish, pale orange hue, we’re left with a bit of a sour taste regarding this particular blaster, and the Super Soaker line as a whole. Growing up, we had blasters from Entertech that were business black. Sure, times have changed, and orange tips are a government-mandated given, but we’re simply not digging the current color scheme. Otherwise, though, the Double Drench is sleek, compact and built to last… it just needs a better color palette. 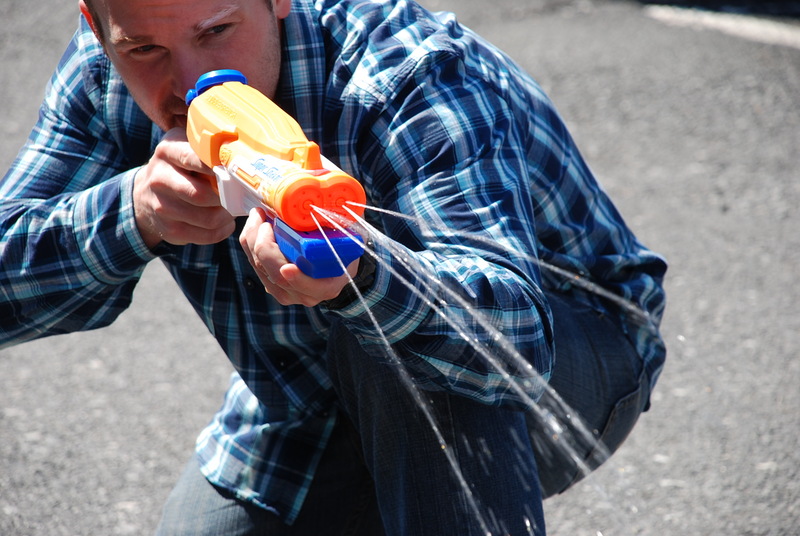 With spring just getting started, we’re anxious to continue testing the latest and greatest in water warfare from Super Soaker, Water Warriors, and others. 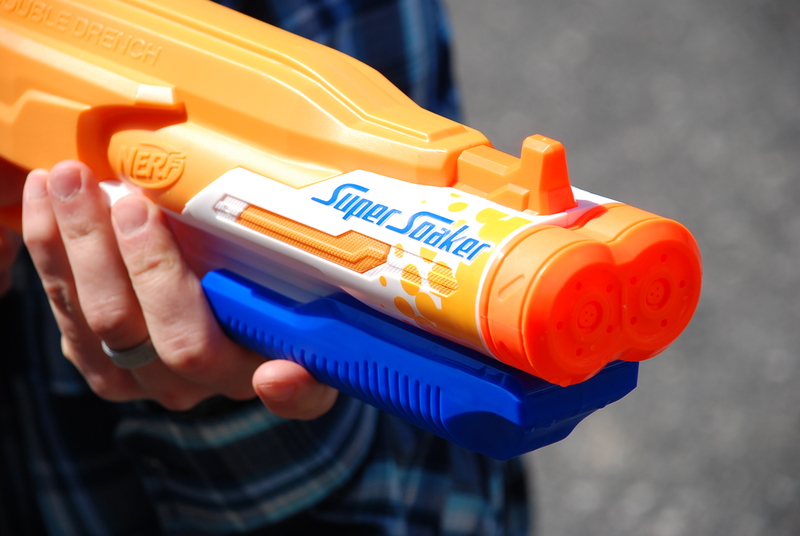 Our favorites to-date have largely been the offerings from Buzz Bee (Water Warriors), but the Double Drench demonstrates that a simple design and solid build quality can keep the modern Super Soaker line in contention. The Double Drench is an obvious choice to supplement your summer pool-side arsenal, and at $14.99 it won’t break the bank, either. For close-quarters water warfare, we think it’ll be hard to beat. 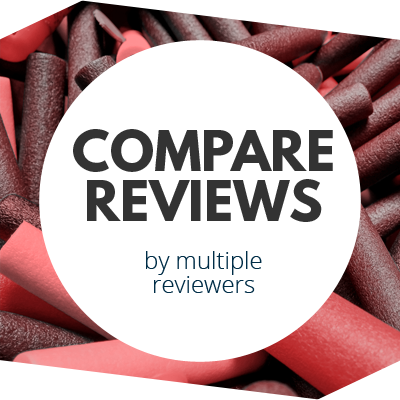 This entry was posted in Reviews, Water Blasters and tagged Double Drench, nerf, review, super soaker on April 11, 2014 by blasterhub.